Do you want to learn how to profit from NFL football betting? 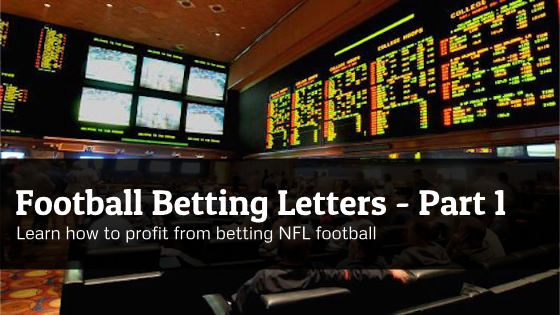 This letter is going to be the first in a long series of letters in which I will communicate to you the important things I have learned in my 25 years of successful NFL betting. I am going to try to teach you about the mindset of a successful bettor, the system you can setup for yourself and how to consistently profit from NFL betting without going broke! There might be some personal stories, and thoughts that toe the line of morality. But in the end, you will be a better sports bettor, with more money in your pocket (or more cars in your drive way!). Also, these letters will help compliment my original book - "Guide to NFL Investing". This betting manual has helped hundreds of people win at NFL betting. The book is a little stale. It needs updating. Instead of a re-write of the book, these letters will be used to supplement that book once completed. These letters might ramble around somewhat. I am going to keep the flow very conversational. Easy to read. I do not expect these letters to be perfectly written. There might (probably) be some spelling errors. I admit, I never won win a spelling bee. But I did create a system for winning money. Teaching this to you is most important. Anyways, lets get started. Truth be told - I haven't always been a profitable NFL bettor. At the time I started wagering, I was a trader on Wall Street. I thought I knew everything. Well, I definitely didn't. I struggled, enormously! Every week it was like I was tossing money down the drain. My bookie (a real human, online betting didn't exist yet) would hound me, daily. It was a terrible felling. Knowing I was wrong, and losing money in the process. Could a feeling be more terrible! Every wager I made seemed like a "sure thing". Well, they were far from it. Most were losers, and so was I.
I had enough. I knew I was better than this. There had to be a better way. So I decided to start doing research. I went to the library or book store and read as many books as I could possible get my hands on. Human psychology, the mechanisms of wagering, other betting systems. I loaded myself with as much information as possible, trying to determine how the "pros" did it. What occurred to my right away? I didn't have a plan. My primary reason for placing a wager? Because I wanted the "action". Did I do homework or analyze the game before placing a bet? Absolutely. But most of my analysis was just to validate the "action" that I craved. Now, lets get this straight right out of the box. Is betting on every football game that is on TV a good strategy for profit? Absolutely not. Let me repeat that - Do not bet, just to bet. Yes it will! Don't do it. Be the guy that shows self control and only wagers when he sees opportunity. OK, do we get that point? Good. It's at the core to any winning strategy. If it seems I am going on and on about this it is because it is so important and something you can do right away! And, regardless of your betting strategy or system, this is a fundamental thing you can do. So I really hope you get started with this mindset right away. It will make you a better gambler or sports bettor right away. If you don't remember anything from these letters, remember this - only play when you have the edge! Good luck and we will see you next letter.